Which sport is a game of ruthless cunning, cutthroat competitiveness and is historically shared by the people of Egyptian, Chinese, American Indian and Polynesian cultures? It may surprise you to find that it is bowling. Whether the players used a shaped stone or a carved wooden ball, whether the field was a sandy beach or an open field, people for centuries have shared in this gentle, yet strategic, game. The most famous story in bowls involves Sir Frances Drake playing a game at Plymouth Hoe when he was notified that the Spanish Armada was sailing up the British Channel. He replied, “We still have time to finish the game and to thrash the Spaniards too,” and went on to finish the game  which he lost  before going out to defeat the Armada. 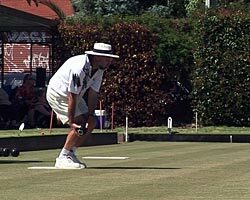 The modern form of the game, lawn bowls, is an outdoor sport usually played on a rolled grass or synthetic lawn, in singles or teams of two, three or four. Other variations of bowls include bocce (bo-chay), boule (bool), indoor bowls, short mat bowls and carpet bowls  perfect for a rainy day or even for a party. Once considered recreation for retirees, bowls is now booming. The neatly pressed whites are making way for colours and restrained whispers are drowned out by raucous cheers as the rinks are invaded by a new generation of players, with the average age of competitive lawn bowlers recently falling to under 40. Many countries are beginning to introduce bowls at primary and high school levels. 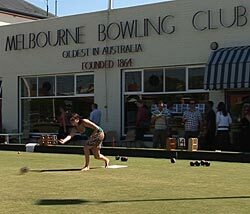 Aside from being intellectually challenging, lawn bowls provides positive social and team experiences, and celebrates offensive and defensive tactics and planning, rather then athletic prowess. It’s one of the only sports where an 8-year-old can line up against an 88-year-old, and either have a very real chance of winning. 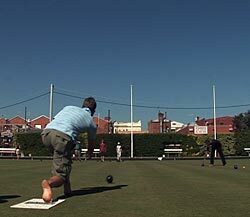 But the biggest boost in the sports popularity has been the introduction of social night bowls. Rules have been relaxed and barefoot bowls has brought a new breed of bowlers stepping up to the mat. Now anyone can come along to the club, kick off their shoes and enjoy a few ends. To begin, the first player rolls a small bowl (the jack) towards the far end. Players then take turns, either trying to place their bowls as close to the jack as possible or aiming to displace an opponents well-positioned bowl. Whilst they may, at first, appear to be round, lawn bowls are actually an uneven shape and roll with the most perplexing curve when you first begin. Considerable skill is required to roll the bowl and have it behave as desired. When playing in team competition there can be a large number of bowls on the green giving rise to complex tactics, which in turn can cause tempers to climb. Communication between team-mates is vital. The team captain, or skip, directs his team’s shots to disrupt the opposing teams scoring shots whilst maximising their own. The two skips then complete the end by rolling their own bowls. It is a game calling for skill, strategy and self control  a sport for both the young and young at heart. So give it a go. You’ll be bowled over by how much fun you have! True health is the harmony of life within us, consisting of peace of mind, happiness and wellbeing.